CLIMATE: Cool winter with possible snow, hot summer. BEST TIME TO VISIT: Summer, Spring, Fall. COMMENTS: In the Panamint Valley. Wild Rose City is known for its known for its charcoal prodcution for the Coso mines in the Coso Mountains nearby. It seems there was no timber in the Coso Mountains, and timber is required in the production of charcoal. So, Wild Rose Camp was founded in the Panamint Mountains were there was plenty of timber. 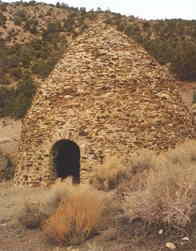 Charcoal kilns were erected to make the charcoal and they are still standing at the site today. 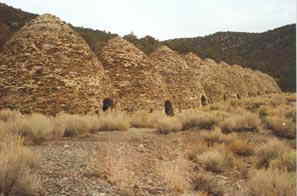 Charcoal kilns near Wild Rose. Courtesy Stanley Paher. and Indians cut the pine to stoke them.